Sipping Tea or Drinking Tea. for Afternoon Tea on Friday afternoon. and was served buffet-style at the dining room table. to a good quality loose leaf tea, and they enjoyed it! I made Harney and Sons Queen Catherine Blend. afternoon for this very special event. You are a very good friend to help like this- no te is better than freshly and properly brewed loose leaf tea- and taking that brewing responsibility from the hostess made for a good day for her, too. I drink H & S tea often but have not yet tried that blend. Looks like fun to me...and they asked the right person!!! It looks like it was a very delightful time. How special that you were able to assist with perfect cups of tea! That's something very special to be famous for --- a perfect cuppa tea! 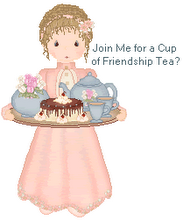 I should think you enjoyed sharing your tea expertise as much as the guests did, having you there. I love your play on the term "taking tea," as I had never thought of it that way. They are certainly lucky they had such an expert to prepare tea for them on Friday! Perfect understanding. There's a difference between transporting tea and being transported BY tea. Cute title! How wonderful to be able to share your knowledge of tea with all the ladies, I'm sure they enjoyed it! Lovely - they will be so pampered! It looks like you were well prepared. How nice that you were able to share.